Photo Caption: From left, Mary Prenon; Robert Shandley; Krissy DiFranceso; Maryann Tercasio, President of the HG Realtor Foundation; Tom Conklin, CEO, Make-A-Wish Hudson Valley; Gail Fattizzi; Stephanie Liggio; Ron Garafalo, HGAR President; Crystal Hawkins Syska; Cathleen Stack and Aimee DeCesare. 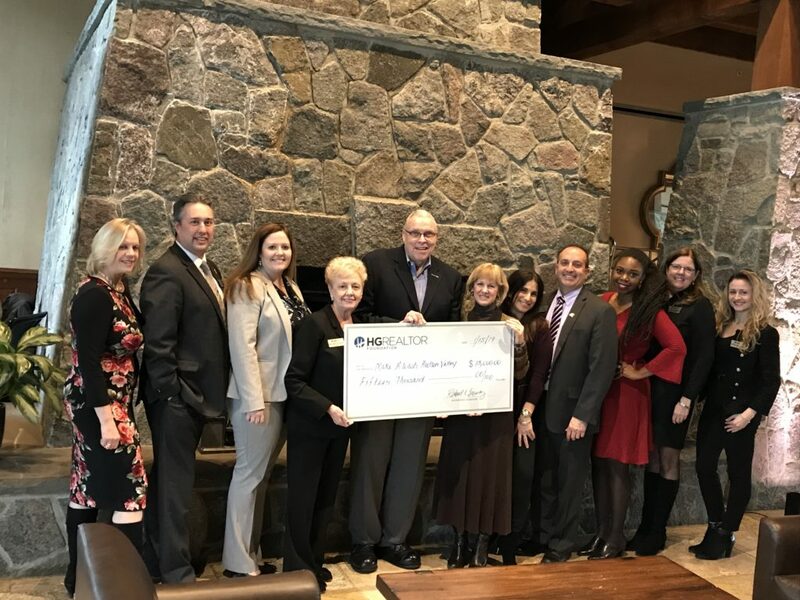 TARRYTOWN—The Hudson Gateway Realtor Foundation, the charitable arm of the Hudson Gateway Association of Realtors recently presented a check for $15,000 to Make-A-Wish Hudson Valley, located in Tarrytown. Make-A-Wish grants wishes to children with life-threatening medical conditions to enrich the human experience with hope, strength and joy. Since 1986, Make-A-Wish Hudson Valley has granted the wishes of more than 2,700 children in the Hudson Valley region with critical illnesses. Serving the eight counties of Delaware, Dutchess, Orange, Putnam, Rockland, Sullivan, Ulster and Westchester, the chapter’s mission is to ensure that every child residing in the Hudson Valley who qualifies for Make-A-Wish services is granted his or her’s fondest wish. While wishes are referred and completed on an ongoing basis, an average of 150 wishes are in progress at any given time. Established in 2004 and relaunched in 2013, the Hudson Gateway Realtor Foundation has donated thousands of dollars to charities and non-profits throughout the Hudson Valley. As concerned members of the communities we work in, the Hudson Gateway Realtor Foundation participates in qualified community-based charities who serve the housing, hunger, health, happiness, and humane needs of citizens everywhere. For more information or to apply for funding from the Hudson Gateway Realtor Foundation, please visit www.hgrealtorfoundation.com. The Hudson Gateway Association of Realtors is a not-for-profit trade association representing almost 12,000 real estate professionals doing business in Westchester, Putnam, Rockland, Orange and Sullivan counties, as well as the Bronx and Manhattan. It is the second largest Realtor association in New York, and one of the largest in the country. It owns and operates the Hudson Gateway Multiple Listing Service, offering more than 20,000 properties in the Bronx, Westchester, Putnam, Dutchess, Rockland, Orange, Sullivan and Ulster counties. It is among the top 50 largest MLSs in the country.